South Korea's foreign minister said Thursday that making progress on denuclearisation talks with North Korea is a "daily concern", as she called for fresh momentum at a joint Korean summit next week. The meeting will be the third between the leaders of North and South Korea this year and comes as talks between Washington and Pyongyang over dismantling the North's nuclear arsenal have stalled. US President Donald Trump and North Korean leader Kim Jong Un met for a historic Singapore summit in June and pledged to denuclearise the Korean peninsula. However, no details were agreed, and Washington and Pyongyang have sparred since on what that means and how it will be achieved. Last month, Trump abruptly cancelled a planned visit by Secretary of State Mike Pompeo to Pyongyang in a major setback. The new US envoy for the North, Stephen Biegun, said in August Kim had promised "final, fully verified denuclearisation" at the Singapore summit. But Pyongyang has slammed Washington for its "gangster-like" demands for complete, verifiable and irreversible disarmament. 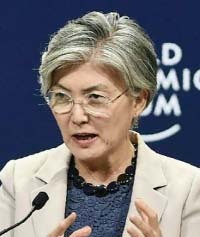 South Korea's Foreign Minister Kang Kyung-wha Thursday urged progress on the talks and said the issue was a central issue for Seoul. "Getting traction on the denuclearisation and peace process that is very much now in motion - it's a daily concern to get movement on this," she told a regional economic forum in Hanoi. She added that she hopes that the September 18-20 summit in Pyongyang "will be a significant step forward in denuclearisation and peace". "A second summit has to be something that really significantly moves the agenda forward… there has to be concrete deliverables," she said. Her comments come ahead of the September 18-20 meeting in Pyongyang between Kim and South Korean President Moon Jae-in, who brokered the Kim-Trump summit in June. Moon has called for a "bold decision" from Trump and Kim to successfully denuclearise the peninsula and urged a follow-up meeting between both sides. The White House said earlier this week Trump had received a "very positive"
Moon has called for a "bold decision" from Trump and Kim to successfully denuclearise the peninsula and urged a follow-up meeting between both sides. The White House said earlier this week Trump had received a "very positive" letter from Kim seeking a follow-up meeting, since adding it is in the process of coordinating a possible second meeting between the two leaders..